Discover top-down knitting from the ground up! 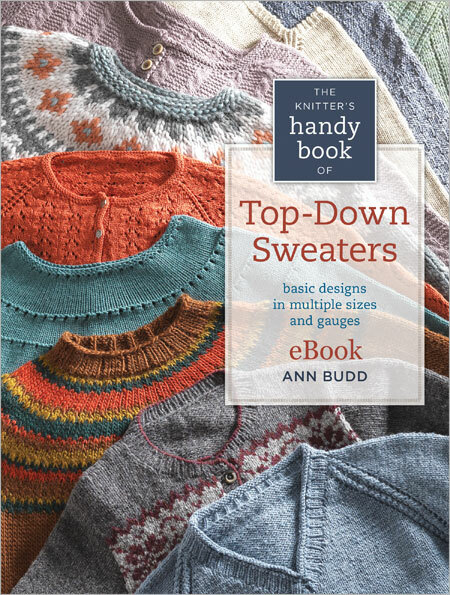 Fiber and yarn enthusiasts will celebrate Ann Budd’s latest addition to The Knitter’s Handy Book series. Answering to a growing interest in knitting sweaters from the top down and knitting seamless sweaters that require little finishing, this handy book offers instructions for knitting five basic sweater types: circular yoke, raglan, modified-drop shoulder, set-in sleeve, and saddle shoulder. Patterns are offered in multiple sizes and yarn gauges and for a broad age group. Following the basics for each of the five sweater types are three diverse patterns from top designers that illustrate some of the many ways the instructions can be used as springboards for creative expression, including color, texture, and shaping variations. Also included for intermediate to advanced knitters are personal design touches, detailed charts, clear instructions, and quick tips to expand your knitting possibilities and maintain creative originality. A key reference for knitters of all skill levels, this is the new essential knitting resource for your bookshelf.